(CNN) -- Defending champion Jelena Jankovic raced into the quarterfinals of the Italian Open in Rome on Wednesday as her opponent, Kateryna Bondarenko, retired through illness. 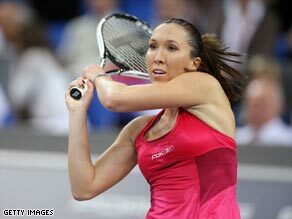 Jankovic enjoyed an easier passage into the quarterfinals in Rome. The dust had barely settled on the exit of world number two Serena Williams in the early hours of the morning, when Serbian Jankoic was back on court. She had struggled against Gisela Dulko of Argentina in her previous match, but brushed aside the ailing Ukrainian with some ease. Jankovic took the first set 6-1 and was 1-0 to the good in the second when Bondarenko pulled out after just 35 minutes. Williams, who caused controversy by insisting she was the best player in the world despite losing top spot in the rankings to Dinara Safina, did not live up to her boasts. Her match against Patty Schnyder did not start until past 11 p.m local time and finished well past midnight as she crashed to a 6-2 2-6 6-1 defeat. It was Serena's first match in almost a month and her first on clay this season. Jankovic has won the Italian Open for the past two years, but her ranking has slipped after indifferent form and is looking to regain best form after a slump at the start of the year. Safina is in action later on Wednesday, as well as Venus Williams, who will play Anna Chakvetadze in the night session and hoping for better luck than her younger sister.